Collaborations : FZD (Forschungszentrum Dresden – Rossendorf), LCFIO, Institut de la Lumière Extrême (ILE), Amplitude Systèmes, THALES-TRT/DGA, USP University (Sao-Carlo, Brazil), CELIA, CEA-CESTA. Three kinds of investigations were more specifically realized inside this thematic : 1) a deep experimental and theoretical study of the electronic and thermal refractive index variations observed in the main laser materials based on the Yb3+ and Nd3+ active ions when they are submitted to intense optical pump excitations, a subject which was addressed within the framework of a DGA PhD thesis with THALES-TRT and within a CAPES-COFECUB program with several brazilian universities of which USP from Sao-Carlos ; 2) the crystal growth and the deep analysis of the optical and spectroscopic properties of the Yb3+doped fluorite CaF2, material discovered and implemented for the first time in Caen already 10 years ago and which now enters into the realization of numerous sub-picosecond laser systems such as those developed within the ILE-Apollon program in France or the PENELOPE one in Dresden Germany ; a subject which was initiated first in close collaboration with the FZD-Rossendorf in Dresden, the LCFIO in Palaiseau and the Amplitude Systèmes Cie, more particularly within the DGA-RAPID program DYPTER and the ANR Femtocryble, and which was extended in the last years, with the help of the same groups as previously and the CELIA laboratory in Bordeaux, within the framework of the ANR Pampero, 3) the crystal growth and the analysis of the evolution of the spectroscopic and thermo-optic properties of Nd3+ doped CaF2 crystals when there co-doped with non-optically active (buffer) ions, the aim being to develop ultimately nano- et subnano-second high power and large size laser amplifiers able to compete with the Nd3+ doped glasses used nowadays in laser systems like the MegaJoule laser (LMJ) by allowing laser runs at higher repetition rates ; subject started in Caen in 2013 in collaboration with the Shanghai Institute of Optics and Fine Mechanics (SIOM) and being now pursued within the framework of a PhD thesis and a contract with the CEA-CESTA and the collaboration of the CELIA laboratory in Bordeaux. 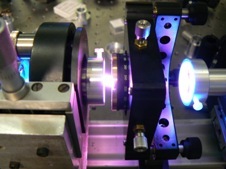 A first part of this theme concerns the research of materials for compact solid laser sources emitting in the visible range based on rare earth doped materials with low phonon energies. The emission wavelengths are more particularly in the red and green spectral domain for compact RGB laser sources and in the orange to address :YSO specific absorption lines of Praseodynium-doped crystals for quantum information processing. 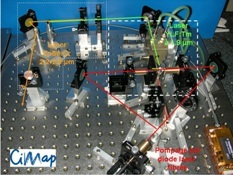 Three alternative pumping sources were considered and examined : InGaN blue laser diodes around 445 nm, optically-pumped semiconductor lasers (OPSL) around 479 nm or, more originally, frequency-doubled 3-levels Nd lasers around 469 nm, the latter approach allowing the possibility of pumping with high power (several watts) and good beam quality lasers. This research field is still under progress within the framework of a a fruitful collaboration with the University of Xiamen in China. 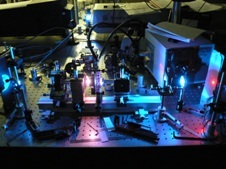 Many fields of applications exist for the laser sources emitting in the mid-infrared around 2 µm. In wavelength domain, performance of ultrafast lasers are constantly improving, their development being similar to devices already made around 1µm. Low energy sub-picosecond pulsed oscillators, with controlled emission wavelengths and pulse durations, are boosted in different stages to achieve the high energies required for applications. Among the materials used in this research domain, fluorides doped with Tm3+ and Ho3+ ions have a prominent place. Our research fits into this framework with the Labex program FASTMIR which aims at the production of amplifiers based on rare-earth-doped fluoride crystals. Crystalline layers of YLF:Tm having thicknesses of several µm have been already grown by the LPE technique and laser operation with a very high efficiency was already recently demonstrated around at 1.9 µm.